i rustled around in the kitchen drawer for my bonnet and it is pinned quite precariously upon my bonce for the foreseeable future. Our #1 had surgery yesterday and is now home recovering, however we managed to squeeze in a few days of crafting before the op. it was muchly lovely to pottle together talking yarny things and then coming home to sit side by side whilst Our Meg happily wove on her homemade loom and i woolly tattoo~ed. little short pottles around the shed whilst paying close attention to my girl and working on future makes. i am also working on other thrilling nitty gritty things which may cause me to be a little quieter than my usual quiet self here. Our #1 comes home to play today ~ for a whole live long month! for those who may have read my previous post on letting go and now fretting about no dottie angel frock pattern ~ please do not fret, it will be published in June, i cannot say who with or how until May, then with permission i will spill the beans. dottie angel frocks are still very much a part of who i am and where i am going, alongside of woolly tattoos and teaching again. i needed to make space in my head and my heart and my shed, for when i do that, magical things happen such as woolly tattoos. who knew i would be doing such a thing but because i made a small space for calm and contemplation when all around me and inside of me was chaos, woolly tattooing happened. it was for me a magical happening and for me to water it, sing to it, and nourish it, i needed to let a lot of dottie angel's past go. this past weekend i continued upon my path of magical tidying up forever and ever. i am quite sure some folks and dearies are thinking "ummm, have you noted Tif's magical tidying up forever and ever is actually taking her forever and ever?" and yes, on some days i am thinking the same thing. however let us be fair, i did take off two months due to clan and holiday interruptions in-between starting my magical tidying up forever and ever and then picking up where i had left off to continue upon my merry magical tidying up forever and ever path. and thus, this weekend i went back into the room which held eight years of dottie angel and i set to with magically tidying up forever and ever. for i knew i had reached a point for me to move forward, i had to let go, and can i tell you, this was not a thing i decided upon a whim, this has been inside of me for a long time. i have been working up to it without even knowing it, but i know it now and awareness can be a magical thing. with the help of my man offering to take things away without questions asked, i let the past 8 years of dottie angel go. i kept very few creations which still give me joy when i see them, that connect me to a time which makes me happy, however the rest my man piled high into the back of the car and took to Goodwill. i felt it quite apt and surely most fitting dottie angel wares and other handmade goodness i have crafted over the years for our home should end up on the shelves of despair, to bring a little joy to another thrifty hunter going about their secondhand hunting day. a chance to be loved again, to find a bit of happy out in the world. i would be telling a gigantic fib if i said it was an easy thing to do, for it was not, it took all my snoopy courage and some more. at one point i sat on the stairs with tears rolling down my cheeks, having my hand held from across the pond via text and Our #1. so many good peachy times, so many bad pants times from the past 8 years with dottie angel came flooding through as each and every creation, stitched from my heart was held in my hand for one last time. but can i also tell you dearest reader, never in all my days of dottie angel have i been so sure and i am positively beaming inside as i tippity tap this, for i have made space in my crafty cogs and my crafty heart ... i can see clearly again, no longer weighed down from the past. today i awoke, dottie angel still by my side. i noted, both of us a little wiser and both of us quite a bit lighter. 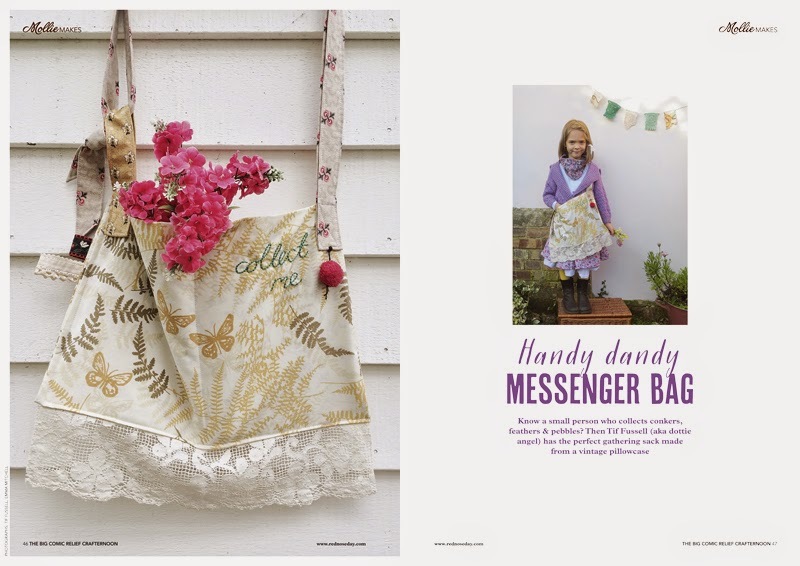 my woolly tattoos and fleshy ones made it into the latest issue of UPPERCASE. some of you may know them as the publisher of my first book, i am positively thrilled to be in amongst their fine pages again. 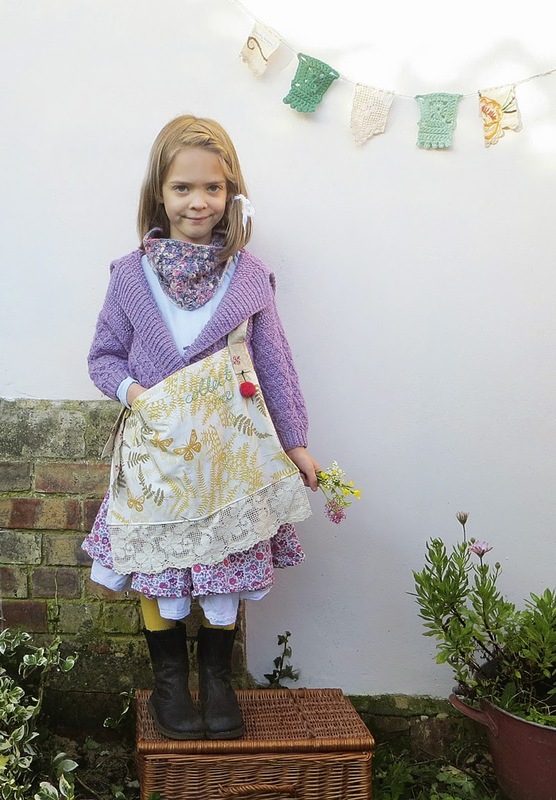 i am beyond happy to be telling all about The Big Comic Relief Crafternoon today! i have known for quite some time about this most marvelous event and can i tell you it is really quite extraordinary how hard folks and dearies have been working for months behind the scenes to bring this brilliant idea together. if you are in old blighty, today is the thee day (thursday 29th Jan) you can pottle on down to Sainsbury's to nab a copy of The Big Comic Relief Crafternoon. it will cost you a mere 7.99 (that is in pounds, i cannot find the pound sign on Colin the Computer, thus i must write it) and a whole whopping 5 pounds of that goes to Comic Relief! goodness, that is impressive! how peachy is this small being, i am thinking Rose looks particularly mischievous and i am wondering what she has been collecting in her bag to cause such a pesky smile. yes how lucky am i, to have been invited to participate for such a worthy cause. can i tell you my crafty soul was warmed through and through, just to think no matter the fact i have been misplaced abroad for years, i am still a Brit in the eyes of others. inside the pages, you will also find a handy guide to running your own craft fair in aid of Comic Relief, filled with nitty gritty to answer all your questions. every crafter featured has donated their time and their recipe for others to make and in turn we are super hopeful you will raise lots of crafty cash to support fabby projects in the UK and Africa. well my lovely readers, i am hopeful i have covered everything. i am hopeful if you didn't already know about this thrilling event you will now, and you will be rushing off to Sainsbury's to pick up a copy of The Big Comic Relief Crafternoon so you may get a little crafty with your crafty buddies at least twice a day before putting on a most marvelous craft fair in your neck of the woods. WAIT!!! a little ping just went off in my cogs, that is so not true Tif, that is a big whopper, for there is a way for those not on the fair shores of old blighty to get hold of everything. yes indeedy! 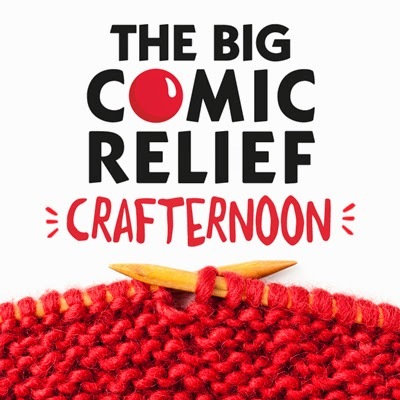 you can find The Big Comic Relief Crafternoon on iTunes too!! oh happy happy day! no tears of sorrow to be had around the globe, only tears of joy, for all can feel a little crafty now for a jolly good cause. i am thinking it will truly be a most splendid thing to do and i am thinking, you are thinking it will be too. i am muchly happy this week as i was a little crafty. i have a ways to go with getting what is in my crafty cogs out but i am happy to be seeing progress even if it is slow. next i will work on a small being size and then i am hopeful i will spend my time wisely making more in the weeks to come so i may pop them up for sale alongside of other handmade goodness and secondhand whatnots come early spring. and just a little note, for those that asked if i would share the pattern for my 'numptie or nice' hat. i am truly delighted you should wish to make one too, however as i have plans to sell the finished product alas and alack, i am unable to share my design for the time being. thank you kindly for your understanding. yesterday issue 39 of little thing magazine plopped on our doormat. i say plopped but that is a lie. i say plopped because i wished to use the word because it made me smile. the truth of the matter is, no magazine did any kind of plopping at all on our doormat or otherwise. it was actually handed to me by a very nice delivery dearie whilst Our #4 held a little pesky hound back by her neckerchief. and Stanley the main man (who resides with Rachelle in old blighty). the article mentions Rachelle's new spiffy dog book, which truly is worth a ganders if you are the sort to make your doggie buddy handmade goodness and then follows a Q & A with our constant canine companions. and as i sit here today, feeling full to overflowing with love for my late friend, i know if Little Olive had been asked "what is your favourite big thing?" she would have answered without hesitation "my favourite big thing is Sunnie Star"
will it be woolly tattoos? will it be handy dandy project sacks? for a small doggie who has lost her light? i like playing in their windows and still can't quite believe they let me. tis tres tricky dicky to get a picture of the windows. from the outside you just get a reflection, from the inside you get mainly the high street traffic. i took some snap shots and sent them to my clan. "ummm, mum, isn't that just our house in the window of the yarn shop". 'when i let go of what i am, i become what i might be' ~ Lao Tzu. i am thinking these are some very wise words indeedy and worthy of pondering. by hook or by crook i did it! came out through my hands and finished up upon my bonce. a full circle kind of moment i am thinking.